Amazing view of the gulf from this luxurious, one-bedroom, two-bath, spacious (833 square feet) vacation home rental at the Majestic Sun on Seascape Golf Resort in Destin, Florida. Wake up each morning, open your eyes, and see the ocean! The living room opens up to an extended balcony where you may sit and enjoy your morning coffee, dine, or just watch the dolphins play (may be seen at dusk and dawn)! This beach condominium rental includes a stacked washer and dryer inside the unit for your convenience. A fully equiped kitchen is provided with all the necessary cooking utensils. 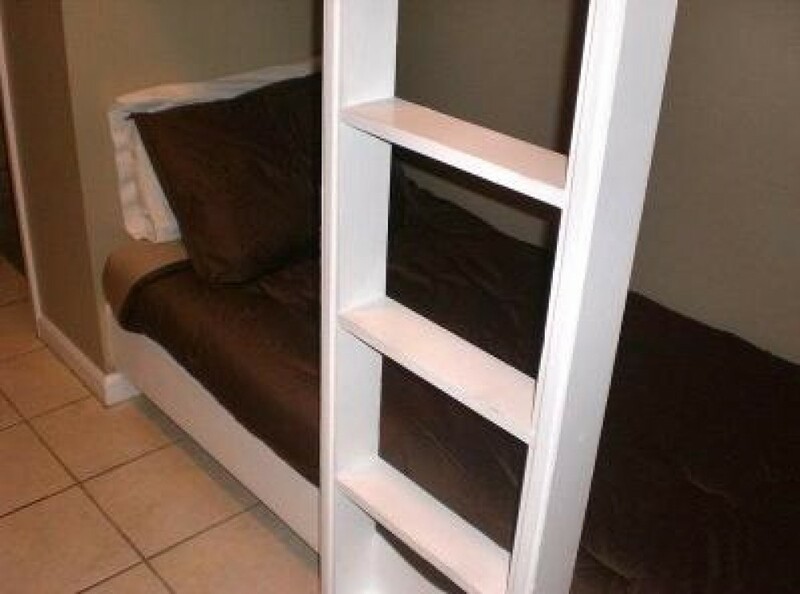 There is a king-size bed in the master bedroom, two twin bunk-beds for the kids are built into the hallway wall! A very comfortable, sleeper sofa may be found in the living room. A TV/DVD has been placed in the bedroom. Your upgraded Florida Gulf coast vacation rental home has been designed by a professional interior decorator. Rich gold, red and brown colors blanket the home. Your professional cleaning crew will clean and inspect your immaculate vacation home just prior to your arrival. You will not find a nicer one bedroom at the Majestic Sun! Only guests of the Majestic Sun and its affiliates may use your privately gated heated multilevel indoor and outdoor pools. So relax poolside and enjoy a drink, play in the refreshing waterfall, or soak your stress away in either of your in ground hot tub spas-all overlooking the beautiful Gulf of Mexico! The MajesticSun is located on the beachside of Seascape Golf and Tennis resort. The beach is just across a small street. The private white sandy beaches are approximately 50 feet from the front door of the Majestic Sun! Seascape Golf and Tennis resort owns 2,000 feet of white sandy beach!! An onsite beach-chair service and TIKI bar is there to assist your beach relaxation needs. A short stroll towards Seascape’s beachside Whale’s Tails restaurant and bar will take you right by the water-sports checkout desk where Parasailing, Wave Runner Rentals, Kayaking and Paddle Boards are available, as well as Resort Bike Rental. You can rent a jet ski, wave runner, catamaran boat, or jump on the floating fun-deck (all services are subject to availability). Seascape Golf and Tennis Resort offers all of the amenities of a world class resort. Your backyard consists of 18 holes of some of the most beautifully manicured fairways and greens that Destin has to offer. Designed by the famed course architect, Joe Lee, the par 71, 6,100-yard championship course winds throughout much of Seascape’s 300 acres of lush landscaping and tranquil lakes. Breathtaking views of the Ocean can be seen from several holes!! Retire to the Clubhouse bar after your round of golf for a cocktail. Be sure to stop by the Proshop for the sale opportunities, or to schedule a lesson on the driving range and practice greens. If Tennis is your game, you must visit Seascape’s 5 Star Tennis club. Fernando Guarachi, USPTA Director of Tennis at Seascape and his staff are available for instructional lessons for any age level. Interested in a great workout? Try Cardio Tennis! Fine dining choices are plentiful at the Majestic Sun. Room service from the Cabana Café is available, however, if you prefer to cook yourself, grocery stores can be found about 1 mile away. If you prefer to eat on the beach, you must visit Seascape’s own Whale’s Tail Bar and Grill. It is just a few steps from your front door! Fine dining at the Cabana Café is also onsite providing extensive breakfast, lunch, and dinner menus. Feel like going out? Try a dinner cruise with Sunquest Cruises!! There are also many local seafood restaurants close by. Need some excitement? Big Kahuna’s water park and Putt Putt is about 10 minutes away. Sailing, Snorkeling, Dolphin cruises, sunset cruises and fishing charters are also available in Destin. There is something for everyone! Golf, Tennis, Water Sports, and Fine Dining…..The Majestic Sun at Seascape has it all. The amenities offered with this unit cannot be beat. All of this plus a relaxing stay in your designer home with one of the best views in all of Florida awaits you!